“Frozen” was a computer-animated musical fantasy film produced by Walt Disney Animation Studios. It was released in 2013 and it won several awards for being the best animated feature film. It was awarded Best Original Song for “Let It Go”. It quickly became one of the most popular computer-animated movies for children. To my knowledge, there was no magical effect directly related to the Frozen movie, until Hitmitsu Magic came out with “Cartoon Visible Painting”. This one should be a hit for children. In effect, the back of a square folder is shown to contain a matrix of 16 pictures feauring the 4 main charcters of Frozen. They are Queen Elsa, the snowman Olaf, Princess Anna, and Kristoff. The 16 pictures appear to be in no particular arrangement. A child is ask to freely name any number from 1 to 16. The chosen number is counted around the matrix and it ends on the picture of Olaf the snowman. Olaf is considered as the chosen character. The board is turned around to reveal the outline of Queen Elsa instead. This appears to be the wrong prediction. The performer insists that this is the correct prediction. This picture is then withdrawn from the square folder. It suddenly becomes fully coloured and everyone can now see that it is Olaf the snowman donning Elsa’s dress! The predicted character is correct after all! As a climax, the folder is turned around to show its back. It has the matrix of 16 pictures, but they are all the pictures of Olaf! The previous pictures of Queen Elsa, Princess Anna and Kristoff have disappeared! You receive the complete props, plus a QR code to view a short performance of the effect in the Mandarin language. The props are well-made of sturdy cardboard and are nicely designed. You need to take a marker pen and draw the outline of Queen Elsa yourself. Why this outline is not already drawn in when the props are supplied is anybody’s guess. I would personally like to perform it in another way. I have studied the matrix of the 16 pictures on the back of the folder, and have noticed that Queen Elsa can also be forced using the method of forcing Olaf, except you have to start counting from another side of the folder. A little study of the matrix will enable you to quickly understand this. Force Queen Elsa, and turn around the folder to show the outline of Queen Elsa as your prediction. Go into your colouring routine for any classic visible painting. Pull out the picture to show a fully coloured picture of Queen Elsa. It is here that the audience realises it is actually Olaf in Queen Elsa’s dressing. You insist that the child originally picked Olaf, not Queen Elsa. When you have disagreements, turn around the folder to expose the matric of the 16 all Olaf pictures! How could anyone pick some other character originally? In this effect, you have all the fun of visible painting, plus a sucker prediction! One of the greatest gimmicked decks to be invented is Burling Hull’s Svengali Deck. Unfortunately, it is readily available in shopping malls and most magicians shun its use. This is quite unfortunate because a well-crafted routine using the Svengali Deck can effectively disguise the methodology and truly wow the audience. Jason Palter has come out with a Svengali Deck using flash cards that are used to teach young children in kindergartens and schools. These cards consist of simple pictures and words. Somehow, by not using playing cards, the Svengali principle is not suspect, even for those in the know. Such cards are, of course, ideal for performing for children. Because of the pictures, it is also suitable for use in mentalism effects with adults. The use of children’s flash cards makes the prop look like an everyday object. You receive 2 decks of flash cards. One is the Svengali Deck, and the other is an ordinary deck for you to switch out for. It also comes with 4 pages of well-written instructions. Jason adequately explains the handling of the Svengali Deck and describes an interesting kids routine. Creative Magic also produces a similar type of Svengali flash cards. However, they are the same size as the poker playing cards. Flash Forward uses the actual-sized children’s flash cards. These cards are larger and therefore more showy, however, they handle quite well as a Svengali deck. The thickness of the cards is just right and this also makes them suitable for use as a Svengali deck. Christopher Rawlins has created a method that does not depend on any of the 3 methods mentioned. This would make drawing duplication look like real magic. It does! Simply watch the performance in the trailer. In effect, a spectator is asked to draw a simple, yet definite object – it can really be any object at all. She draws on a blank piece of business-card provided by the performer. She then folds the card into quarters, hiding the drawing inside. There is absolutely no way the performer can see what has been drawn on the card. The performer takes a blank business-card himself and draws on it. It is then buried in the middle of a stack of blank business-cards. The stack is held for safekeeping by the spectator. The performer unfolds the spectator’s card and sees the object drawn. Without any funny moves, the stack of business cards is taken from the spectator and spread. Somewhere in the center of the stack is a card drawn by the performer earlier. It has a close resemblance to the drawing made by the spectator! Obviously, if there are no restrictions at all to the object to be drawn, then there must be outs and there cannot be a hundred percent direct hit every-time. Surely, the method itself cannot be simple and must require heavy memorization. This last statement is not correct while the first statement is true. Chris Rawlins has come out with an interesting method which does not require you to memorise anything, and it is easy to perform. The interesting thing about Chris’ method is that it grows on your performances. Every time you perform I.D.D., you get to refine and customize your own gimmick/method. What you receive is a DVD, with no props. In the DVD, Chris describes the props you need. You require a stack of blank business-cards, and Chris will tell you how to prepare the cards. You also need marker-pens and how to prepare one of them. Once prepared, the props can be reused in every performance. There will be no need to construct new props each time you perform I.D.D., unless you refine and customize your method. 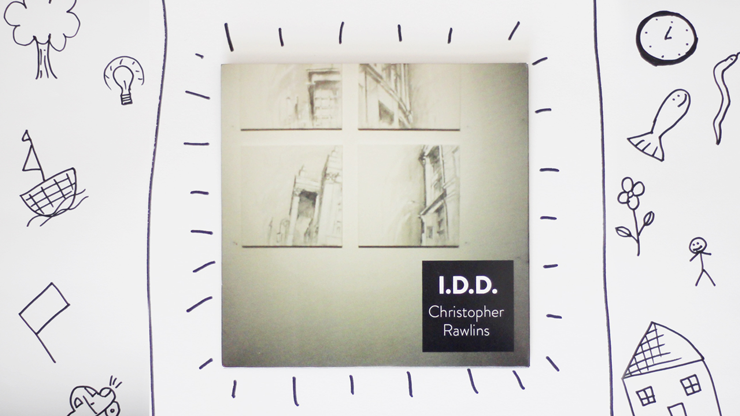 Included in the DVD is a pdf file giving you a 26-page written instructions of I.D.D. Here Chris goes into more details in preparing and performing the effect. Not included in the pdf instructions (but provided in the DVD) is a discussion by Luke Jermay on his thoughts of performing I.D.D. By using index-cards instead of business-cards, the effect can be performed on stage, involving about 10 spectators. Luke also provides a different premise for performing I.D.D. Instead of drawing duplication, it can be presented as a psychic demonstration. • The effect is ultra-clean. Those near-misses are covered very well by the clever method developed by Chris. At times, the duplication can be strikingly close to the original drawing. You can increase the possibility of this happening by refining the method yourself. • Easy to perform – no memorizing, and no new props to prepare for each performance. 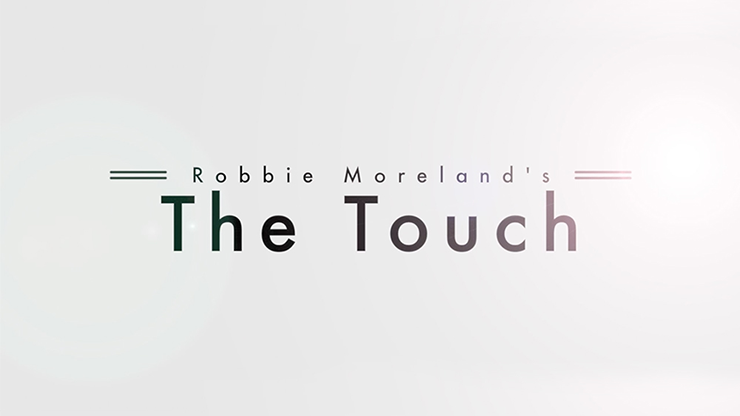 “The Touch” is a DVD that contains 3 of Robbie Moreland’s close-up routines taken from his professional performances. Two of them are card effects while the other is a coin routine. Robbie is an excellent magician. He is elegant in his performance as well as his patter. His routines are very well structured and scripted to achieve the maximum effect on his audience. The DVD is very well-produced. It has excellent sound and video qualities, and an easy-to-manoeuvre menu. Each routine starts with a performance, followed by the explanation. In his explanation, Robbie goes into great detail covering the concepts, as well as the moves required to work the routines. He also recommends and shows various books and resources, where you can reference those moves and concepts. The DVD runs for a total of 2 hours and 16 minutes. A spectator determines a number and selects a card. The card is lost in the deck. As the spectator reveals the number, the deck visibly shrinks into a packet containing the named number of cards! The chosen card is found as the last card in the packet. Robbie mentions that there is “the moment” in any routine. “The moment” for Vibes is when the entire deck visually shrinks into a packet containing the named number of cards. There are no difficult moves with this effect, but the performer needs to influence the audience’s choices. Robbie discusses audience management and describes how to perform the inflated deck illusion. This is a ‘coins through table’ effect, beautifully-routined by Robbie. Three coins are covered by an overturned glass on the table. The first and second coins go through the table, one at a time. Just when the audience expects the last coin to penetrate, the entire glass goes through the table instead. Robbie discusses the correct types of glass and napkins to use, coin-shells and how to maintain them, and the psychology behind the routine. This is a visual piece of card magic and is a real feast for the eyes. There is no “please take-a-card” effect here. A red four suddenly pops up from the middle of the deck. This card then visually changes into 2 red two’s. The 2 red two’s are placed into the center of the deck when they explode into the 4 Aces. The 4 Aces than completely vanish into the deck, only to reappear together again. Once again, they are lost in the deck and found face up together in the middle of the deck. This is the most demanding routine in the DVD, in terms of the necessary skills involved in handling the cards. You need to know the Pinky Count and Pull-down, J K Hartman’s Pop-Up Move, Richard Kaufman’s Radical Change, Baltazar Fuentes’ Colour Change, the S-Fan and Circular-Fan, Steve Beam’s Flop Change, and the Burst Production. All of these are adequately explained and demonstrated by Robbie. Jorge Garcia is a talented mentalist from Argentina. He performs under the stage name “The Jack”. He is a suave and thinking performer. This is evident in the way he dresses up his presentation for his effects such as “A Think & Stop” and “Mind Track”. He is able to take a simple prop such as the Haunted Key and evoke the entire audience’s emotion, as in his effect “Haunted Key”. Not satisfied with the usual presentations of classic effects such as “One Ahead” (his effect “One Head”) and “Pegasus Page” (his effect “To Lovecraft”), he adds in an unexpected ending that makes great sense to the audience. For the “One Head” effect, he ensures that each revelation seems more impossible than the previous one. You receive a well-produced DVD that features 8 mental routines. Jorge performs each routine before a live audience. He then explains each effect at the Alakazam Magic studio together with Peter Nardi. As a bonus, the DVD also provides an e-book describing 7 of the 8 routines. They are taken from his published book “7 Mysteries of Mentalism”. The e-book gives additional ideas on psychometry for using the gimmick employed in his effect “Project Fear”, including a version of Larry Becker’s “Sneak Thief”. For those of you who want an idea of how each of the 8 effects looks like before you make a buying decision, here is a concise description of each routine. What an interesting name for the “One Ahead” prediction effect! Jorge invites a spectator on stage. He uses a writing pad and makes 3 predictions on 3 different topics. Each time he makes a prediction, he writes the name of the topic down on the writing pad and shows it to the spectator. Then he turns away, writes his prediction, tears the sheet out of the pad and crumples it, and puts it onto the spectator’s hand. In the end, he opens all the 3 screwed-up balls of paper in the spectator’s hands, and gets all the 3 predictions correct. Jorge also provides an unexpected ending in which an earlier mistake he makes, turns out to be an additional information for the last prediction! This is Jorge’s take on the Pegasus Page effect. A member of the audience selects a page from a horror book, and a spectator selects a word from that page. The performer has predicted this word in advance. Finally, the entire page vanishes from the book. In Jorge’s version, the torn page is found in another envelope and the entire book is given as a souvenir to the spectator. Jorge uses an interesting gimmick to force the selected page. This is a very good version of “Scissors, Paper, Stone”. It is taken from Robert Neale’s “My First Trick” from his book “Tricks Of The Imagination”. 3 spectators each sit on a chair and is given a large card. On each of the 3 cards are written, separately, Scissors, Paper and Stone. The performer has his back on the 3 spectators and cannot see what is going on with the three. The 3 spectators can exchange cards or move to a different chair. Yet, when given the names of any 2 spectators, the performer can tell immediately who will win. As a climax, the performer has a prediction which states, in turn, exactly who will win against which spectator. Several spectators write their phobia on small cards. A spectator is invited on stage and he writes his phobia on a blank card. This is mixed with the other phobia cards and placed inside an envelope. The performer offers some money if he fails to uncover the spectator’s phobia. Needless to say, the performer gets to keep his money. An impromptu effect that does not require any sleight-of-hand. A spectator chooses a card and loses it in the deck. He and another person name a number each, and they form a total. The performer counts to the total in the deck and finds the selected card. It is based on an old card location principle from “Greater Magic” with a lot of subtleties thrown in by Jorge. This is a multi-phase blindfold act based on Al Koran’s Miracle Blindfold Act. There is no gimmicked blindfold used, nor any sleight-of-hand. While blindfolded, the performer can locate a selected card simply by spreading the cards face upwards. A second spectator chooses and loses his card in the deck. The performer can locate the chosen card, this time, by spreading the deck face downwards. A third spectator chooses a card and the performer can name it. Finally, a small packet of cards is used. A card is selected from this packet, and placed inside an empty cardcase. A fourth card is chosen from the remainder of the deck and mixed up with this packet of cards. The performer finds the fourth selected card, as well as names the unknown card inside the cardcase. A spectator subconsciously memorises a deck of cards. He randomly takes out a card unseen, and puts it aside. He then does an automatic writing and scribbles something on a writing-pad. Subconsciously, he conveys the identity of his chosen card in his drawing. This is an exciting principle that is capable of diverse applications. With just a simple prop like the haunted key, Jorge is able to make it into a magical moment for a spectator. Her emotions than spill onto the audience and everybody then experiences the magical moment of the key turning over in the performer’s palm. The performer even gets a hug and a kiss from the spectator when she reads his prediction silently to herself. Magic with games of chance resonates well with magicians because magicians are supposed to be able to predict or control their outcome. Bingo is a game of chance that involves active participation from everyone in the audience. Magic with Bingo is therefore a great way to achieve excellent interaction with the audience. Mark Wilson has designed his “Magic Bingo” which allows all the participants to win at the same time! Imagine not only the surprise, but the shock as well, when everybody stands up and shouts “Bingo!” all at the same time! Here comes Doruk Ulgen. He has taken “Magic Bingo” several levels higher. He has painstakingly devised a system that enables the performer to control how many participants will win at Bingo all at the same time. He calls it “Miracle Bingo” and it can also end up with everybody winning at the same time, just like “Magic Bingo”. • Who will win first, then second, then third, and so on. • The winning numbers can be different. • What will be the number that will trigger a win. • When (exact time) someone will win – this presentation can be quite uncanny. 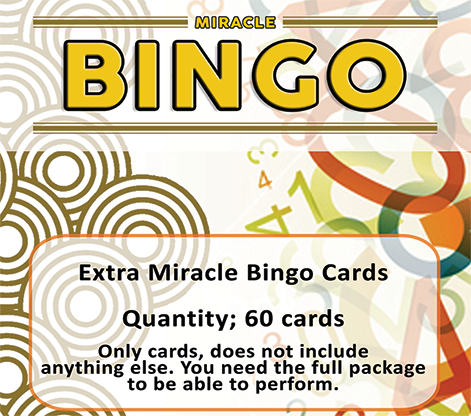 The manner you perform “Miracle Bingo” is only limited by your imagination. • 60 reusable, specially-designed, Bingo cards. • Bingo number discs for calling out the numbers. • An alternative black bag for disc selection. • Printable calling sheets to cross out the called out numbers. • Cheat-card and number-set sheet. • Regular, but a different type of Bingo cards to play an ungimmicked game of Bingo. • Link with password to online video instructions by Doruk Ulgen. The entire effect is not difficult to do. You need to know which Bingo cards to use and which participants should get which cards. The difficult part is in designing the system to be flexible enough, yet controllable by the performer. This has been brilliantly done by Doruk Ulgen. We now reap the results of his wonderful system. He has also provided enough different Bingo cards to give the impression that these are ungimmicked and come from a regular set of Bingo cards. Although the Bingo cards are reusable, additional cards are available upon request. In the video instructions, Doruk Ulgen discusses an interesting presentation idea based on the Hoy’s “Toss-Out Deck” principle. Let us say that there are several people who are waiting for only one number to win. The performer is able to name each of the winning numbers. Doruk Ulgen also teaches you how to “pick up” the force (number) discs without using the transparent force-bag.